WIC Valve AVS series air actuated angle seat single acting spring return pneumatic valve use pressurized air to open the piston valve and close the valve with the build in springs inside the air actuator. This industrial air operated valve is used to control the on and off of the valve for media such as air, gas, liquid, water and steam. 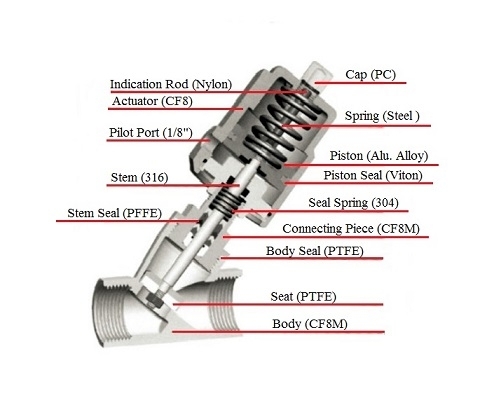 The characteristic of the air actuated piston angle seat valve is that valve can be operated at very high temperature, high viscosity medium, and is less sensitive to dirt particles and debris. The advantage of AVS Series air operated angle seat valve gives a highly efficient flow rate, it can be operated from zero differential pressure (vaccum) and mounted in any position. 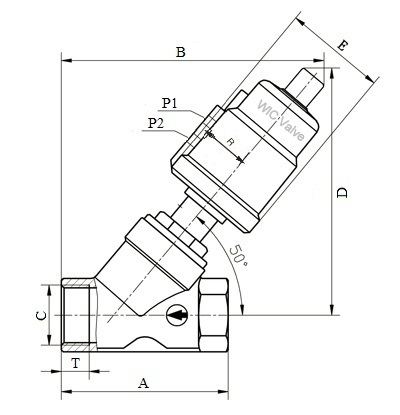 With the fluid entry below the seat, AVS series valve can reduce the water hammering. It features with a easy to see optical position indicator on the top of the actuator, when supply air to the valve, valve is opened and the pin pops up.